The mission at Beyond Broth is to nourish your body, and their organic, healthy and convenient vegan broth packets make it possible anytime, anywhere! Created to fit perfectly into your daily wellness ritual whenever you'd like, these nutritious, instant vegan broths are a healthy and functional solution when you're managing today's often too-busy lifestyle, but aren't willing to sacrifice good health along the way. Made from all-natural certified organic ingredients, Beyond Broth supports your vitality and well-being with every serving. Perfect for home or taking out and about, just add boiling water and in 2 short minutes, you'll be savoring wholesome, nourishing broth that's made only with fresh vegetables and herbs and nothing artificial. Immune Formula - Immune broth supports overall wellness. Enjoy this nourishing broth that warms the body inside and out. Enjoy the mild and satisfying flavors as it benefits your entire body! Use while snow skiing, hiking... standing around the hockey rink, as a savory light breakfast or a hot healthy snack/beverage in the afternoon. Yummy Tummy - Yummy Tummy is the broth that is both warming and soothing. Enjoy as it nourishes and settles the belly, stimulates and supports the digestive system. Start your morning with a cup of organic nourishment on the go. Take it to work, enjoy on its own or add vegetables, noodles, or tofu cubes for a hearty simple meal that is so nourishing and delicious. Vitality Formula - Get a boost of natural energy and a warm "kick" with Vitality! This variety is slightly spicier, increasing circulation and encouraging optimal function of the body and mind. Feel the heating quality and get a boost without caffeine...just simply vegetables and herbs. 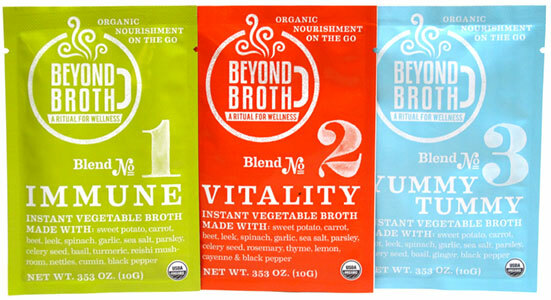 All varieties of Beyond Broth packets are $2.49 each. From Olga of Milwaukee, Wisconsin on 3/9/2018 . I got the tummy blend and it was super bland. Glad I only ordered one!